With a majority of U.S. states, including Oregon, now allowing recreational or medical use of pot, Wyden’s legislation, aptly named S. 420, or the Marijuana Revenue and Regulation Act, yanks cannabis from the controlled substances schedule and sets a sliding scale of taxation, beginning at 10 percent and ramping up to 25 percent over five years. Cannabis is currently categorized as a Schedule I drug, meaning it has “no currently accepted medical use in the United States, a lack of accepted safety for use under medical supervision, and a high potential for abuse,” according to the Drug Enforcement Administration. Despite this official designation, people across the U.S. use medical pot for a wide range of ailments. The Marijuana Revenue and Regulation Act—companion legislation to H.B. 420, which Representative Earl Blumenauer, also of Oregon, introduced last month—is one of three bills included in a legislative package Wyden and Blumenauer call the Path to Marijuana Reform. Beyond removing cannabis as a controlled substance, S. 420 would create a licensing process through the Department of the Treasury and establish other regulations akin to those governing the sale and distribution of alcohol in states where cannabis is legal. Another bill in the lawmakers’ slate of legislation, the Responsibly Addressing the Marijuana Policy Gap Act, sets parameters for expungement of certain cannabis-related crimes, allows weed-related businesses operating in states where cannabis is legalized to use banks, and aims to ensure pot users have access to federal assistance programs, among other provisions. 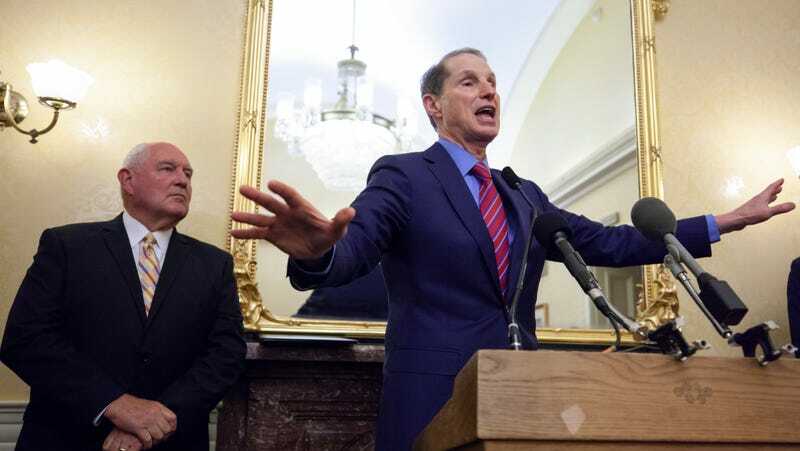 Researchers are also given consideration throughout Wyden and Blumenauer’s legislative package to carry out their work, with the federal government’s blessing. Likewise, the Attorney General would be given the power to determine distributors to supply seeds and immature plants to scientists doing work in this space. The specifics of what nationally legal cannabis would look like will obviously depend on individual states, as well as the AG, ATF, and other agencies vested with power over pot’s cultivation and sale by this passel of bills. However, studies estimating tax revenue numbers from legal states suggest S. 420 could be lucrative for the government. Most importantly, the ACLU estimates around half of all drug busts are for weed-related offenses and by and large target individuals with small quantities intended for personal use. Decriminalization could be a major step away from our unnecessary and aggressive policing practices.